Openness and transparency are good things and the more we have of them the better. Right? Wrong. In contexts of too little openness – “hypo-transparency” – ICTs can help bring greater transparency, with positive developmental effects. But in contexts of relative openness, ICTs are ushering in a hyper-transparency that will destroy public institutions. 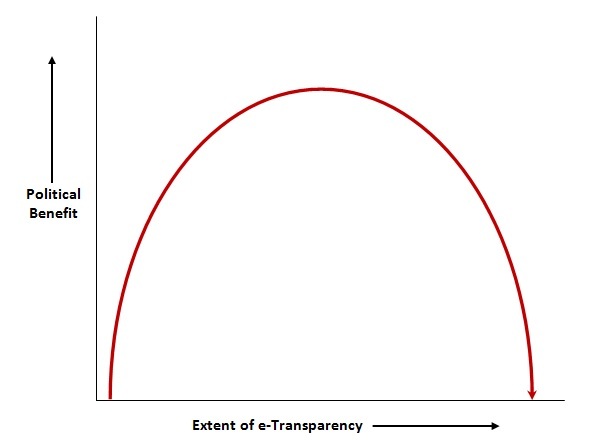 As summarised in the figure below, I therefore propose an inverse-U relation between e-transparency and various measures of political development, such as trust in public institutions. As an experiment, try the following. View your beloved from a very far distance. They are a tiny speck, and you feel nothing for them. Now move closer to view them from a few feet away. Likely you will see much to admire and feel a warm glow (if not, it may be time for an upgrade). Now get up really, really close and examine them in minute detail – take a look up their nose, in their ears, inside their . . . well, you get the idea. That glow’s probably not quite so warm now, is it? Through greater e-transparency, ICTs help us know ever-more about the behaviour (decisions and actions) of those within public institutions. The majority of that behaviour will be appropriate. But humans are flawed, so they will always make mistakes, act selfishly, and do bad things. Absent other effects, the greater the transparency, the greater the absolute amount of such inappropriate behaviour that will be revealed, and the less citizens will value and trust public institutions. Any effects of transparency in reducing the amount of behaviour that is inappropriate are mitigated both internally and externally. Internally, transparency pushes institutions to spend increasing time on non-value-adding defensive activities. These include trying to second-guess and avoid what might cause offence or other negative public reaction; excessive caution in behaviour to avoid risk or failure; and inefficiencies in protecting necessary confidential interactions – the “safe space for genuine deliberation” – from external gaze. Yet, “without the exchange of confidences, it is not possible for people to have real confidence in their colleagues and in the organisations that employ them”. Externally, ever-greater flows of e-transparency data undermine public institutions because of . . .
Cognitive deficits: the greater the flow of data, the lower the absolute availability of knowledge and motivation among the public to properly interpret that data, leading to a dominance of simplistic interpretations, many of which are negative because of . . .
Cognitive bias: the negativity bias that causes humans to attend more to bad than good news, to remember bad more than good news, and to form negative stereotypes more quickly which are more resistant to disconfirmation. And the tendency, for example when searching online, to attend to extreme rather than average data. Extreme and negative interpretations of data on public institutions become more prevalent because of . . . Political incentives: attention and profile online accrue to those who posit more extreme views, and there are plenty of commentators who have political or economic incentives to criticise current public institutions and who – within already-relatively-open contexts – are able to do so. They have an ability to shape the narrative in part because citizens give up their own interpretation due to cognitive deficits. And thus we have a self-reinforcing spiral. A decline in trust in the European Union from 40% to 30%. A decline in Americans’ confidence in Congress from 27% to 7%. A halving of Americans’ confidence in news media. Of course e-transparency is not the only factor behind trust, but a review of some key literature finds little evidence that transparency builds trust. Instead, “in a number of cases, the evidence points in another direction: that is, transparency may ultimately decrease trust”. This has a number of negative knock-on consequences if lack of trust leads to calls for greater transparency which leads to a further erosion of trust. With only a minority – sometimes a small minority – of citizens trusting institutions, those institutions are weakened in their ability to defend the public realm and public interests. And we see a shift in power from public to private institutions, and from centrist to more extreme political views and parties. We are guided by the inverse-U curve to give highest priority to using ICTs to open up the most-powerful, least-transparent institutions. That means authoritarian regimes and transnational corporations. Oh, and FIFA. Don’t applaud Edward Snowden until he exposes the workings of the 3PLA, or Julian Assange until he leaks the tax avoidance plans of global IT firms. If you want a transparency hero, pick Herve Falciani. We place greater emphasis on accountability than transparency. Transparency, in Furedi’s words, fosters “a political culture of voyeurism”. Accountability – at least when properly designed – fosters reasoned, considered checks and balances against abuse of power. We accept there are limits to openness, and that we want transparency but not hyper-transparency: “A democratic society should understand that it is important to uphold the right to the private exchange of views and that not everything officials do ought to be visible to all”.